The worst drivers in the world award goes to….. Beard length (Tom): Captain Ahab. Skin colour (both): The pitch at the WACA. It’s no wonder there are so many young Kiwis in London, they clearly can’t afford to live here! We’ve been in New Zealand almost a week now and our mouths are agape every time we see a family with a modest picnic – “how in the name of God can you afford that”, we both think, “are you a millionaire or something?”. A cheap loaf of bread is over 2 quid, a tin of corned beef is 3 quid. I won’t start on the cost of excursions, for fear of more Victor Meldrew comparisons. We’re having lentil soup for tea tonight and we’re off booze for the duration. My parents are planning on coming here next year – Dad, I’m afraid you’re going to have to sell a kidney (and the house). 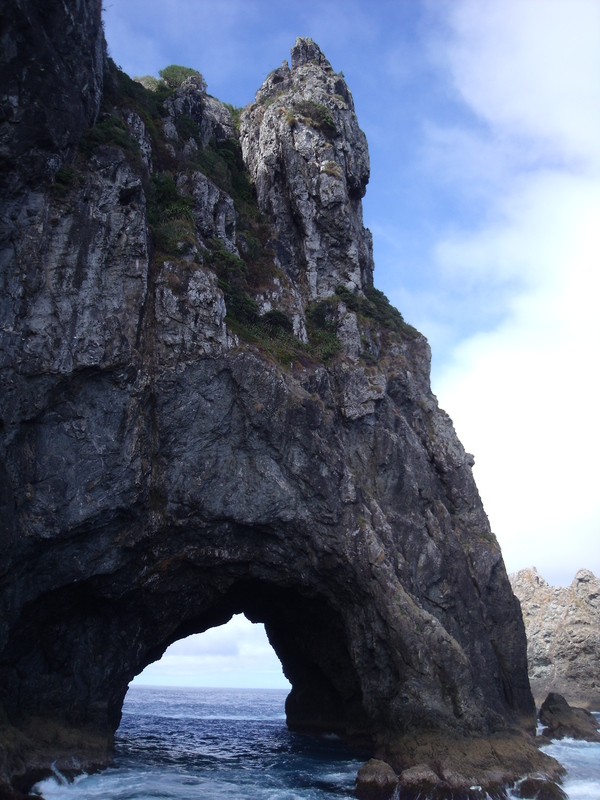 Other than the high cost of living, New Zealand is so far excellent. It’s clean and modern, friendly and beautiful – in short it’s everything you’d expect. Every town we go through is a bit like the town in the film “The Truman Show”, and you feel as though you want to stay in them all. We arrived in Auckland after a 12 hour flight from Santiago which took 30 hours due to the international date line. We’re assuming that nothing good happened last Sunday. 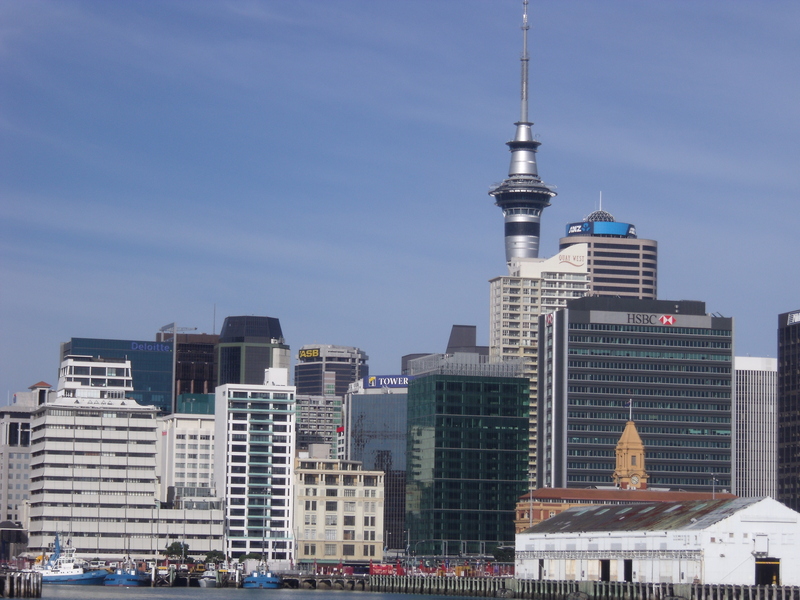 We had three days to potter in Auckland, and a very pleasant city it is too. 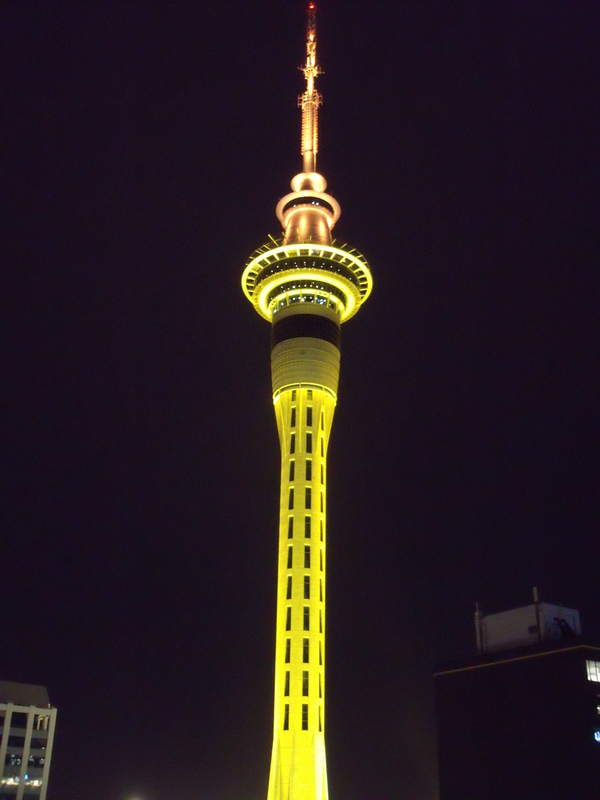 We were staying in the central business district, right near the Sky Tower and surrounded by the shops and cafes (which we studiously avoided). Due to jetlag and lack of inspiration, we only did a couple of “sights” in Auckland. The Auckland museum was huge and interesting, but a little bit random, with sections as diverse as “coastal waters” and “Pacific Island clothing”. Thrillerama. 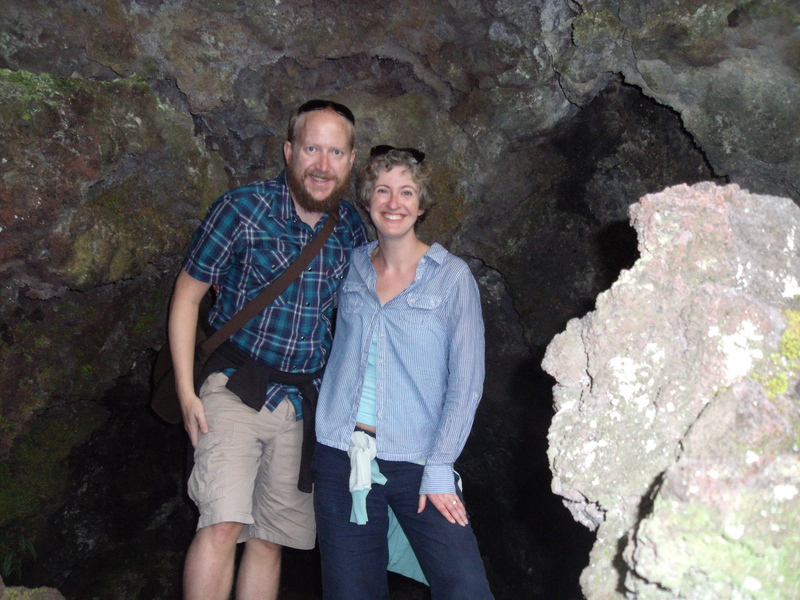 We also did a trip to a volcanic island (in fairness, the whole country is volcanic) called Rangitoto, which involved a catamaran journey across the bay, a brisk uphill march to the volcano cone, a short detour to some lava caves and a knackered wife making any excuse to stop and drink all the water her husband was carrying. And on the 4th day God said “let there be a garishly painted, small, expensive Toyota camper van with (infuriatingly) automatic transmission and 280,000km on the clock”. And lo, there bloody well was. 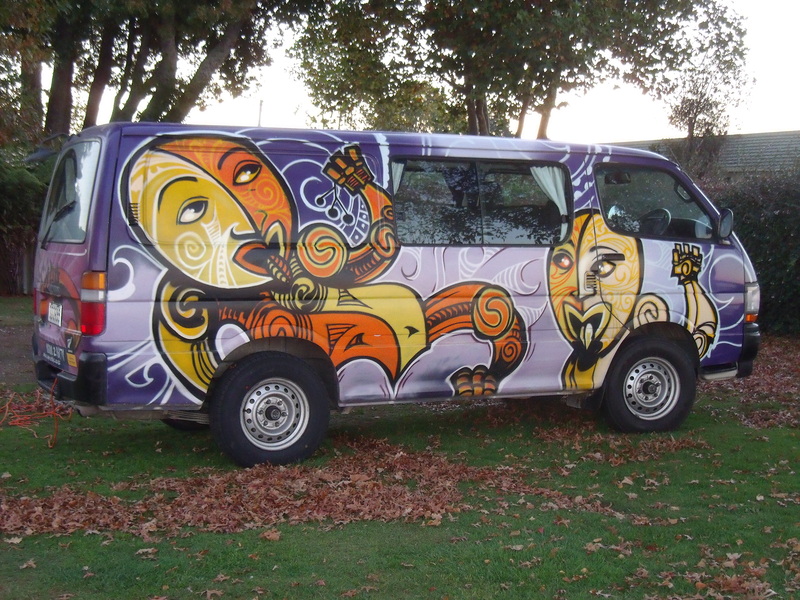 Yes, we’re going to be travelling around New Zealand in a work of “art”, which we’re reliably informed was painted by someone who smokes a lot of dope (we’d never have guessed). 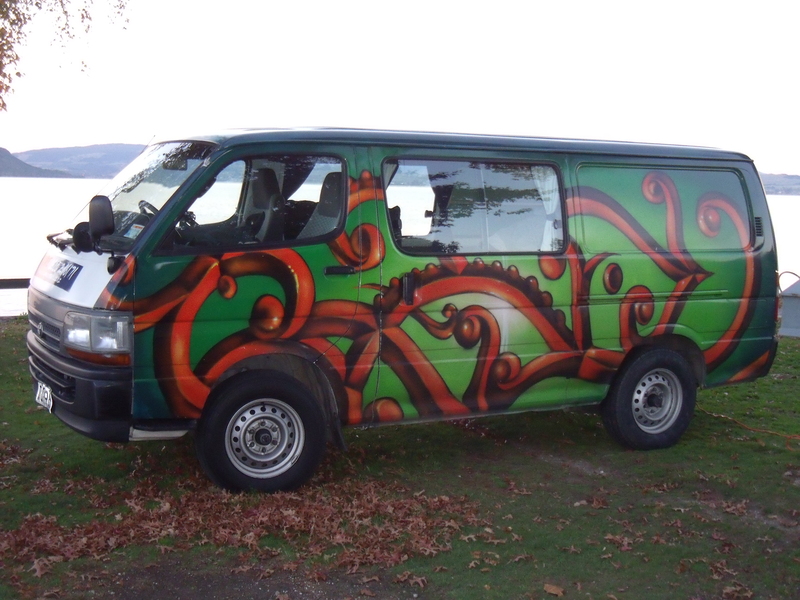 We were actually taking bets on what colour the van would be – I went for pink and Jane went for green. Neither of us went for scary peach angular faces on one side and green with brown tentacles on the other. It moves though, and that’s the main thing. It’s the other poor road-users who have to look at the outside who we pity. Our first jaunt in the aforementioned monstrosity (BTW, name suggestions are very welcome, we’re currently unwilling to name it for fear of becoming too attached to it), was a 3.5 hour drive (0.5hrs doing unplanned laps in Auckland) up hill and down dale to Paihia, in the Bay of Islands. One thing quickly became clear to us. I’m no Fangio, but Kiwis have to be the worst drivers in the world bar none. The drivers in South America are scarily fast and reckless, but they can drive. The drivers in New Zealand are neither too fast nor reckless, they’re just rubbish. Example 1: if you’re going from a 50 km/h speed limit to a 100 km/h speed limit, you might expect that the person in the ridiculously painted van in front would accelerate from 50 km/h to up nearer 100 km/h upon passing said speed limit sign. It might be a good idea to wait and see if this happens before starting an overtaking manoeuvre. Already we’ve seen a few surprised/confused/terrified faces when they’ve pulled alongside a van that now is doing 100 km/h and they’re in a lane with an oncoming truck. It’s rather like feigning to throw a stick for a dog and watching its face when it wonders where the hell it’s gone. I’m really starting to enjoy it, and it will continue to be fun until I cause a multiple car pile-up. Example 2: Tail-gating is a national obsession. They don’t actually want to go any faster than you’re going, they just want to be in front of you. This is fine by me, but driving 20 feet behind me at 100 km/h in a torrential downpour is probably pushing it a bit if you barely know what a steering wheel is. Example 3: We spent a very happy 15 minutes watching several drivers (all male I hasten to add) try and fail to parallel park in a space approximately the length of an oil tanker. Honestly, it was embarrassing – two of them even got their passengers to get out to “watch them in”. I can only imagine what was being said “Yep, you’ve got 8 metres, keep coming”. They all gave up, and presumably went to find an empty field to park in safely. We loved it and we’ll continue to report on the shortcomings of Kiwi driving. Paihia was a lovely place, very relaxed and with friendly tourist information folk (this is a novelty for us after South America). Our campsite was stunning, 10 feet away from a river looking directly at a waterfall – we couldn’t have wished for a better spot to spend our 4th anniversary (which was a low-key day, the highlight being a chicken curry pie for lunch!). 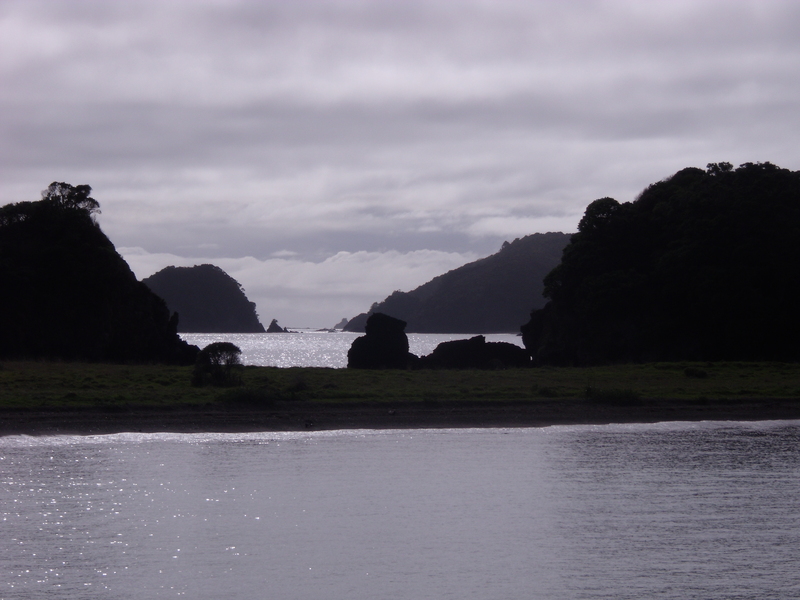 We headed out on a cruise into the Bay of Islands the following day, where I once again proved that I can burn in any conditions and after my autumnal toasting I resemble a panda in negative. The cruise was excellent, the highlight being a close encounter with a large pod of dolphins (around 20-25 of them), who were frolicking and feeding, throwing fish out of the water and generally being lovable. 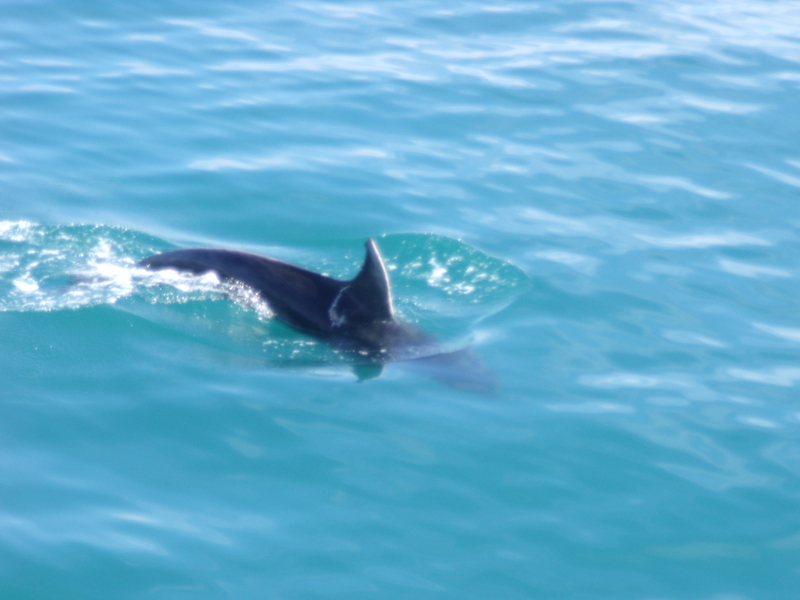 We followed them for about 20 minutes, although we sadly couldn’t swim with them, as they had juveniles with them and there are strict regulations in place. Dolphin - there are better photos, but I don't have them here! After another night at our idyllic campsite (and surprisingly good, if cold, sleep), we headed back to Auckland in horrendous conditions, to pick up extra duvets and a power cable for the little TV which came with the van, had an abortive search for an open dim sum restaurant and headed south for Te Ahora. Te Ahora was really just a stopping point on the way to Rotorua, but it was again very pleasant (apart from the fly-infested kitchen at our campsite), with much flatter landscapes. We picked something which wasn’t flat to walk up the following morning, heading 45 minutes up a muddy mountain. Jane inexplicably spurned her hiking boots in favour of some flat-soled numbers, so it actually took us longer to get down than go up, at times Jane was like a waterskier with my hand acting as the rope. We headed south again in the afternoon to Rotorua and Jane was disappointed as we passed through Matamata not to see any evidence of hobbits, since this is where they set the Shire in the Lord of the Rings films. I was nonplussed and more interested in why the ipod wasn’t working. 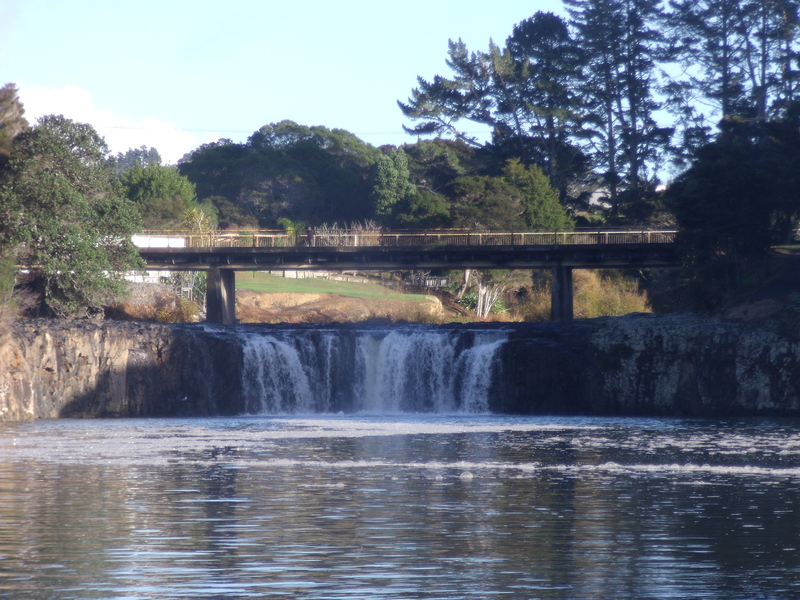 If we thought our camping spot in Paihia was good, our spot here in the little suburb town of Ngongotaha wasn’t exactly shabby. 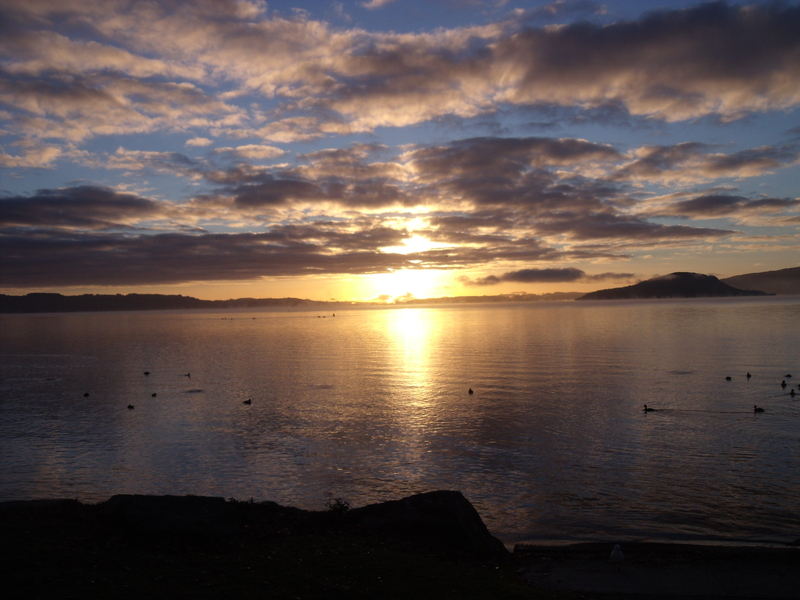 We were literally on the banks of Lake Rotorua last night, accompanied by ducks and gulls. Both sunset and sunrise were breathtaking, as was the bitter cold. We’re going to be scouring charity shops for more clothes! 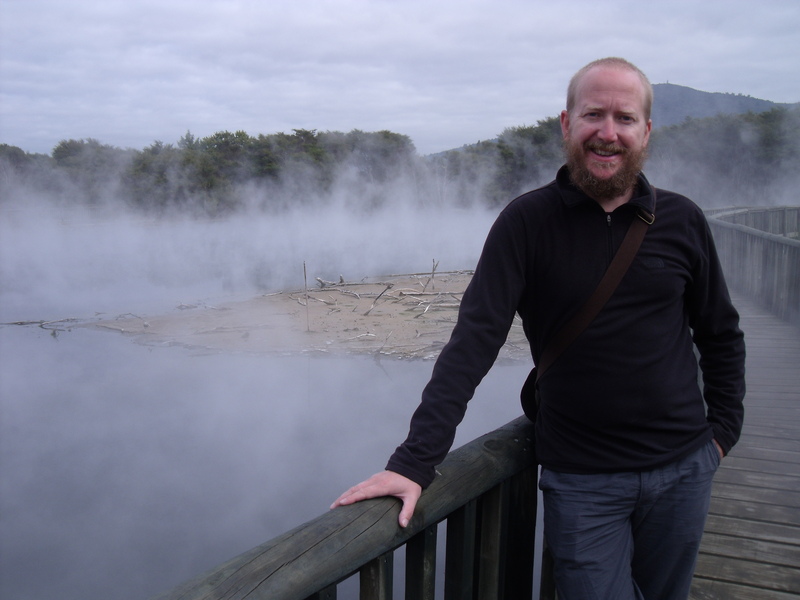 We’ve done the walking tour of Rotorua this morning, taking in a small Maori village where they wanted to charge us ten dollars each to look at their church and meeting hall (no thanks) and a park with steam vents, bubbling pools and that oh so eggy smell of sulphur (no charge – yes please!). We’re turning our backs on the main event here (the geyser and mud pools “experience”), since it costs 100 dollars and includes a three-hour Maori concert which we could probably do without. Instead we’re heading south when I’ve finished writing this to a cheaper version (but sadly, one without the Maori concert – oh damn). With the money saved, we’ve splashed out on a tin of corned beef for lunch! That’s all from us for now – there are some more photos uploaded but I’m afraid we’re quite a way behind, since they’re taking forever to upload and none of the campsites have internet access. my suggestion for the van – spacepod. :o) love the beard Tom….. The bus should be called Shaggy – looks like the scooby doo bus after shaggy got hold of it whilst high 🙂 Or Banksie which would be obviously taking the piss a bit! Thanks for super introduction to NZ! Name for your gorgeous vehicle: what about Lady Gaga? 1. How do you know of Lady Gaga? You do realise that you’re in your eighties and therefore shouldn’t have heard of any popular music act since Vera Lynn? 2. Why should the van be named after her (or shouldn’t I ask!)? Gosh, is there an actual person named Lady Gaga? And who is Vera Lynn? As to the name, vehicles are usually given feminine names, and whoever painted your wagon was clearly gaga. BTW, with that beard, though it seems to set your female friends on fire, you need to watch out for pogonophobics, who are unpredictable and can be violent, especially if certain colouring arouses their iophopia as well – so be warned! Why is your beard a different colour from your hair? You too Tom? And i’m worried you are going to get beard line tan marks that will ruin my wedding pics! What tan lines? It’ll be eight months work in August and it’ll be staying put. You can find a stunt husband for Jane if it’s a no beards wedding! Tom I want you now you have that beard. Do I detect a hint of sarcasm in your comments ladies? So all the stories about NZ being so ridiculously expensive are true! I think we’d better start work again. I had a giggle at the vision of Jane coming down the ‘hill’ like a water skier – that’s usually my trick! As for the beard, no comment! I’m working on a name for the van & I’m sure I will have come up with something by the time you have to hand it back. I have absolutely no memory of such ridiculous prices – I have distinct memories of cheapness! Was I really that drunk for five weeks? Tell me you didn’t spurn the delights of “Geothermal Wonderland”??? We’re spurning anything that isn’t free at the moment! In fairness, we are paying for some things – we’re not that cheap yet. The beard is running wild my friend – although I’m currently investigating how to tame the side bits!